The summer can be a busy season for most preschool teachers and parents. We’ve been cooped up with the kids all winter long and even in the spring (as I write this April, 15th there is snow on the ground). As the mom of 4-year-old and 8-month-old boys I know how much energy has been stored up through the winter and needs to be released. My 4-year-old Aiden wants to run, play and get as dirty as possible outside so I have to get creative about reading and preparing my son for preschool. 1. Take Reading Time Outside – We read in our yard and at the park so we can get our outside and reading time in. I try to select books that are about nature, animals or include a summer activity…..like riding a bike. 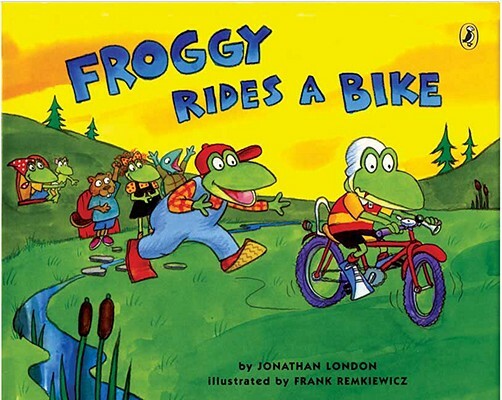 One of our favorites to take outside is “Froggy Rides a Bike” by Jonathan London. My son was ready to learn to ride his bike after reading about how Froggy gets his first bike. 2. Take Advantage of Down Time – Early childhood literacy skills can be taught through activities, not just reading. We take advantage of our time when going for walks or driving in the car. I ask Aiden what different things we see are so that he can learn new words and associate it with an image. Our favorite game is saying the letters on street signs. Aiden says the letters, I tell him what the word is and he repeats it. 3. Sing – We sing a lot. 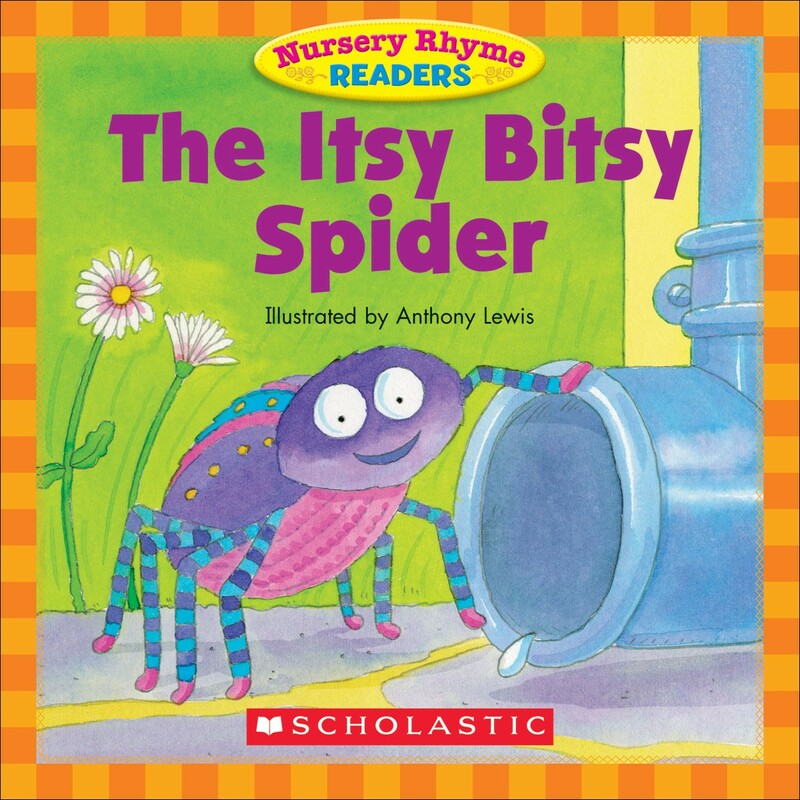 Songs and rhymes can help build vocabulary and develop sound discrimination. Both skills are crucial to the development of literacy. The size of a child’s vocabulary and his or her ability to discriminate sounds are predictors of how easily a child will learn to read when exposed to formal instruction. Aiden and I have learned how to say “hello” in many different languages through the song “Hello to All the Children of the World.” One of Aiden’s favorite songs to sing to his baby brother is “Head, Shoulder, Knees and Toes.” “Itsy Bitsy Spider” can be a fun song to sing outside. 4. Dramatic Play – Let your child be the narrator of his favorite stories while you both act the story out outside. Dramatic play allows children to recognize that different tasks require different texts, to produce a wide variety of texts, and to act out stories they have heard. 5. Library Storytime – Whether it’s at childcare through the Racing to Read program or at the library, storytime is great for children. They will learn through stories, play, songs and much more. Plus, they get to be with other kids. My son will participate in the Kenton County Public Library’s Racing to Read early childhood literacy program this summer. The Racing to Read team brings library materials and Summer Reading Club to the classroom. Classrooms at each center will read together and earn prizes. 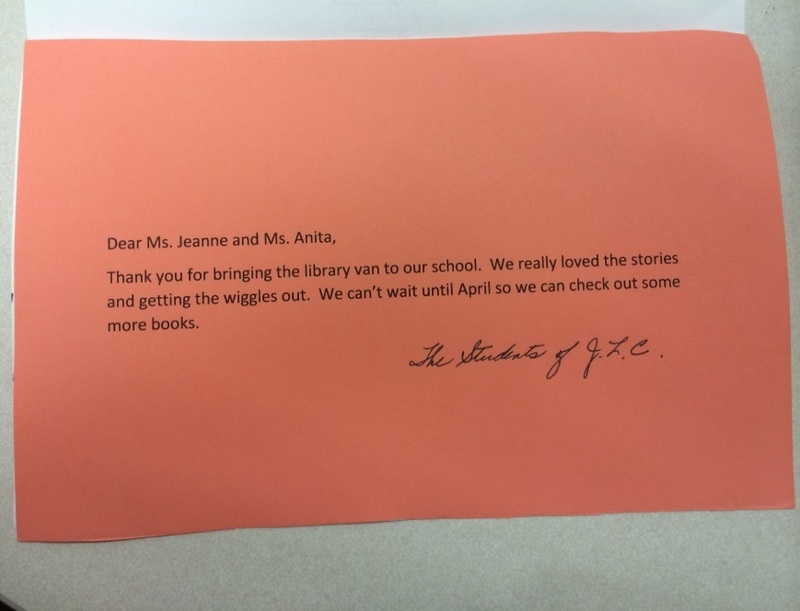 This is one way we encourage the centers we serve to continue to read to their children during the summer months. 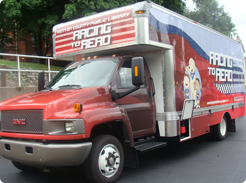 Racing to Read serves 1,500 children ages 0-5 and visits 35 preschools and childcare centers monthly in Kenton County. The goal of the program is to introduce children to books and reading so they are prepared to learn how to read when they enter kindergarten. Children are able to check out two items with their Racing to Read library card. In addition the van offers teacher resources that can be used at the preschool/child care center. Racing to Read staff members put together a lesson plan each month and adjust the lesson plan to meet specific center needs. 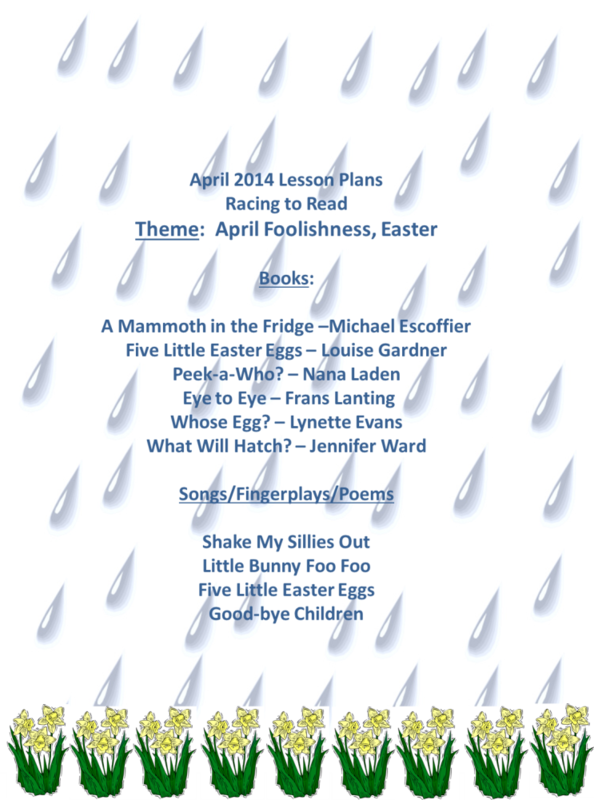 The picture below represents a lesson plan for April. 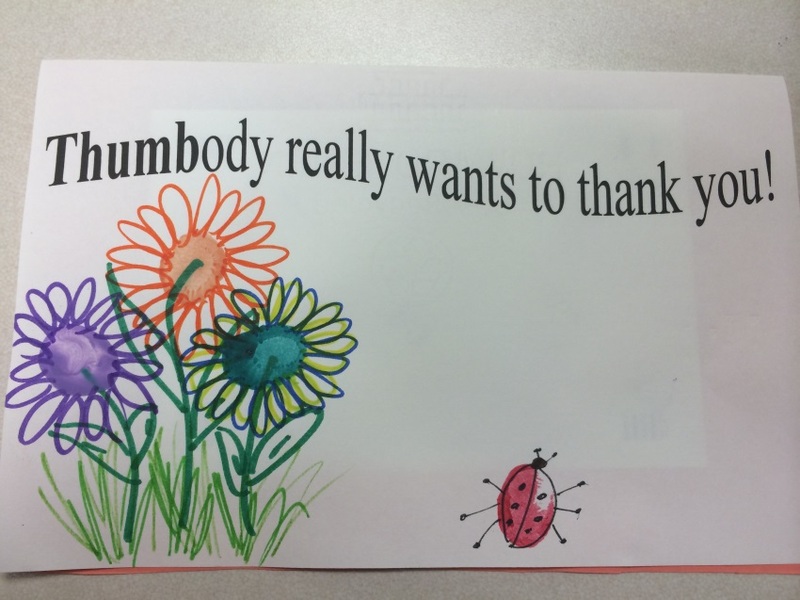 Not too long ago the Racing to Read staff received a lovely thank you note pictured below. The note is from Julie Learning Center located in Park Hills. The Read Racer has a few afternoon spots available. If your childcare facility or preschool is not currently receiving visits from the Read Racer the director of the center can call Kari Jones at 859-962-4061 to schedule a visit. We also currently have a waiting list for centers that require a morning slot. If you would like to learn more about Racing to Read services or all Outreach services, please visit us at http://www.kentonlibrary.org/outreach. Check out the library Early Literacy Pinterest page and suggested books to prepare your child for preschool. Visit the Kenton County Public Library Facebook page to enter to win preschool books and a movie!